I started a photography blog to post some of my work on. I realized that their needed to be a separation of farm & photography so there you have it. Although, you will still see pictures of the farm and our family here. There is just no getting around that! GO DOWN TO THE NEXT POST TO SEE PICTURES OF MY BEAUTIFUL NIECE! I didn't want you to miss them. You can see the photography blog HERE and it will also be linked over to the side. 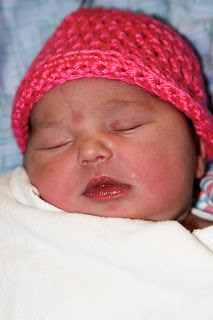 Ava Joy Aldape was born Monday, August 20, at 9:01 am. She was 7 lbs 12 oz and 20 3/4 inches long. Ava (don't you love this name??) is absolutely beautiful and precious in every single way. She has the blackest hair and the most beautiful eyes. I'm so proud of my sister. She allowed me to be a part of such a special day in their lives and I was blessed. Kayla was so amazing in the delivery room and has been an incredible mother to Ava. David, Kayla, & Ava are doing wonderful. We are glad that Ava is finally here! When Kaylyn saw Ava for the first time she said the funniest thing. She was looking at her with her face all scrunched up and said,"Mommy, her belly button looks like a piece of bacon!" I realize that I probably should receive a big fat 'F' in blogging. I have been the worlds worst at updating this thing. My computer crashed last week and I think I've just been plain ole' scared of my computer ever since. So, for those of you who actually still visit this pathetic excuse for a blog, I promise that I will get over my fear of my computer eventually. We have lots going on out here on the farm and my husband is too OCD to have our blog stuck on July 30. We love those Mosiers, but it is time to move on. This is our very first egg, among a few others, that we are hatching. If you look closely, you can see this little chicks wing. 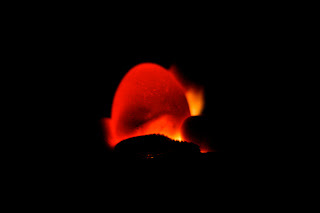 This technique is called 'candeling'. 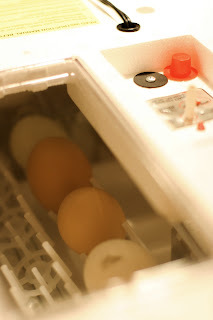 We use this to see if the eggs that are sitting in the incubator are fertile since not all eggs are fertile. BTW....I did not know this prior to becoming a farm girl. 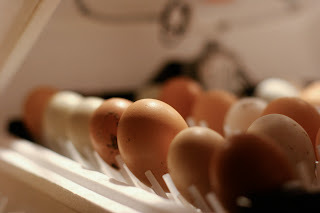 All eggs have yolks, but not all eggs that are layed were fertilized by a rooster. Some are and some aren't. But, the ones that are fertilized are actually better for you to eat (still in yolk form of course!!!). We could actually see the chick moving around inside the egg. It was super cool! It has been sitting in an incubator on the kitchen countertop. 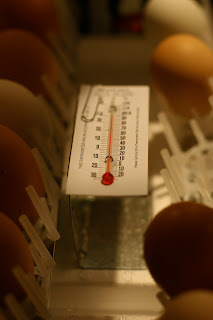 We keep the temperature at 101.5 degrees F. The eggs stay in the incubator for roughly 21 days and day 21 is in a few days. So, we need you to come up with a name for our very first Yonder Way chick. The winner will receive free e-mail updates of the status and wherabouts of their namesake. I promise to make them interesting and fun. It might even be a rooster! How cool would that be? Sorry, 'Mac Daddy' is already taken. I know that we have some pretty creative people that read this blog.....hopefully, they still do! So, I'm trusting you to NAME THIS EGG!